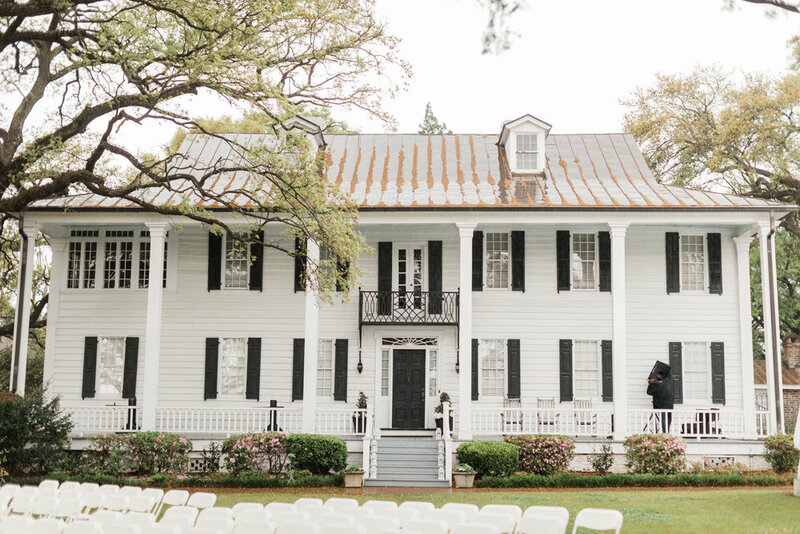 It might be lucky to have a rainy day wedding, but that still doesn't stop most brides and grooms from hoping against a cloudy forecast. 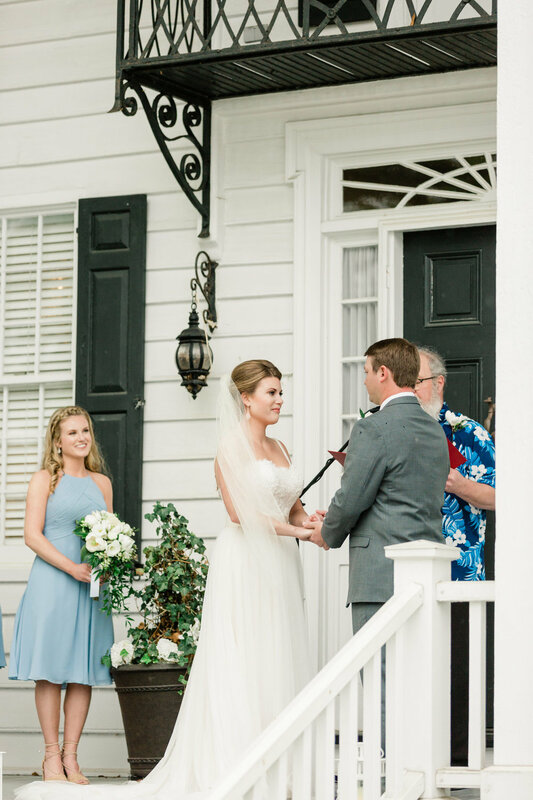 Still, when the rain does come, it's been to handle the situation with calm, poise, and big smiles...which is exactly what Morgan and Stephen did when the clouds rolled in the morning of their Grand Strand wedding at the Kaminski House Museum. 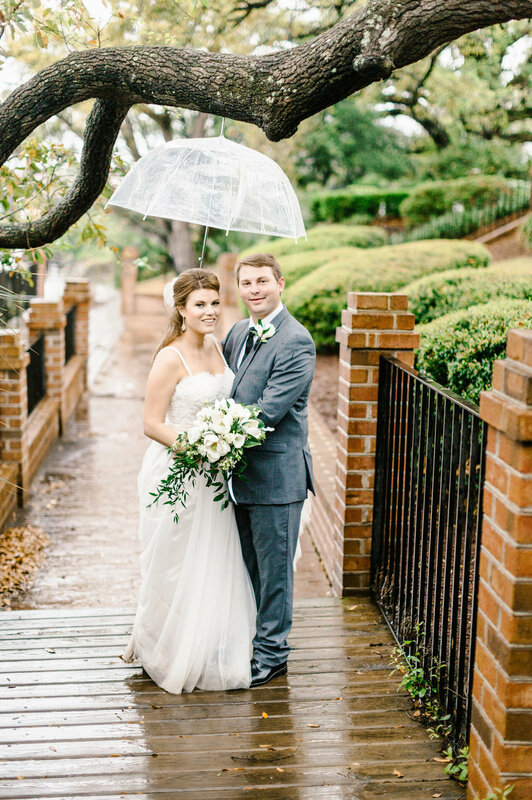 Their upbeat attitude was infectious and allowed the day to shine beautifully even if the weather didn't cooperate. 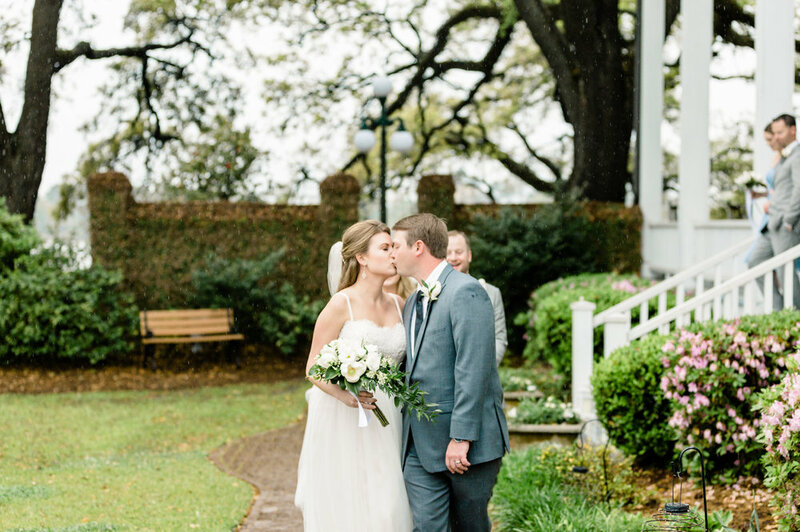 "Even though the rain wasn't ideal, the show must go on, and Morgan and Stephen’s day turned out nothing short of beautiful!" shares photographer Stephanie Gore. "Great friends and loving family brought the sunshine with their unwavering support and ability to be flexible." 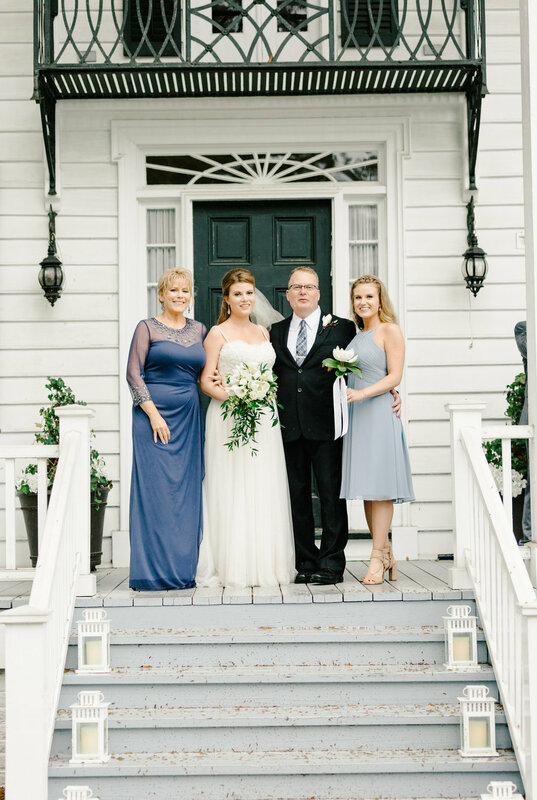 The couple gathered with their nearest and dearest at the Kaminski House Museum to exchange vows. 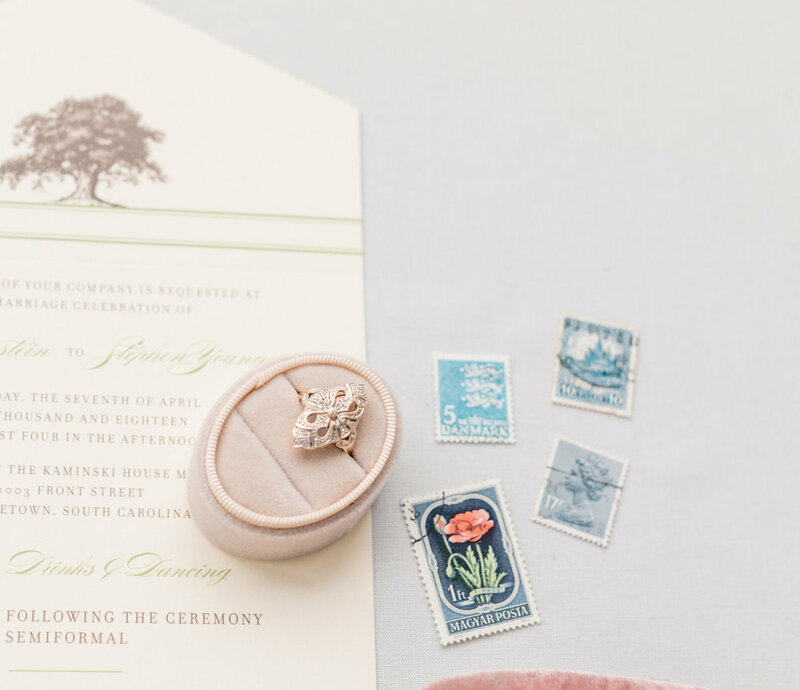 The venue's lush setting was the starting point for their entire wedding planning process, so they were delighted to be able to secure a spot on the venue's event calendar. 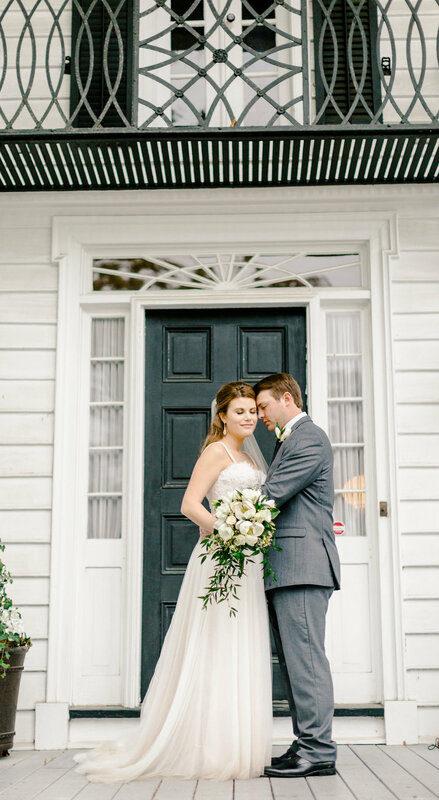 Says the bride and groom, "We were inspired by the historic Lowcountry style of the Kaminski House when styling our wedding. The classic venue overlooking the Sampit River did not require much decoration." 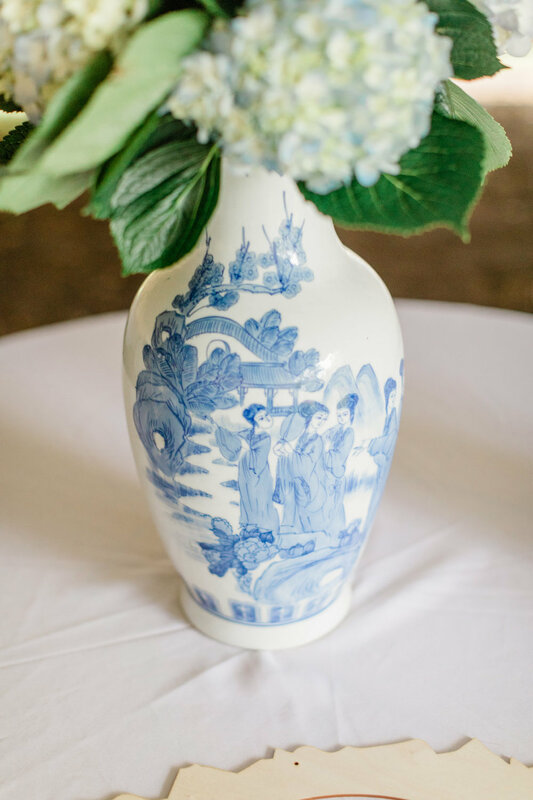 To enhance rather than compete with the venue, Morgan and Stephen chose to decorate with simple florals. 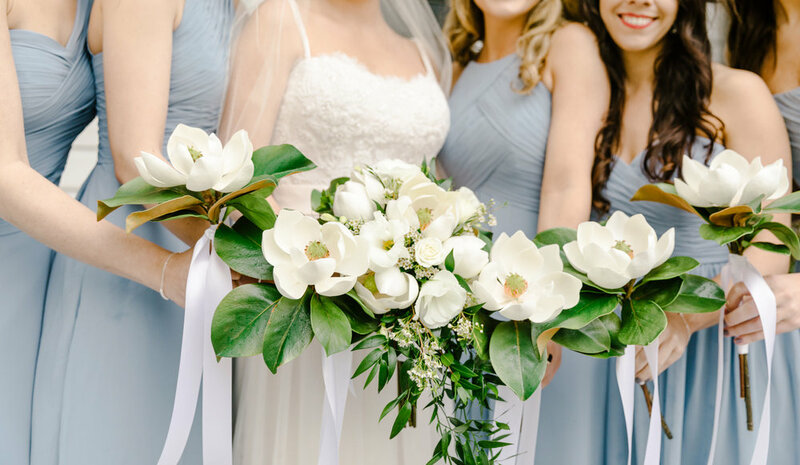 Blue hydrangeas and magnolias appeared in their centerpieces, bouquets, and boutonnieres and highlighted the lush trees and greenery at the venue beautifully. 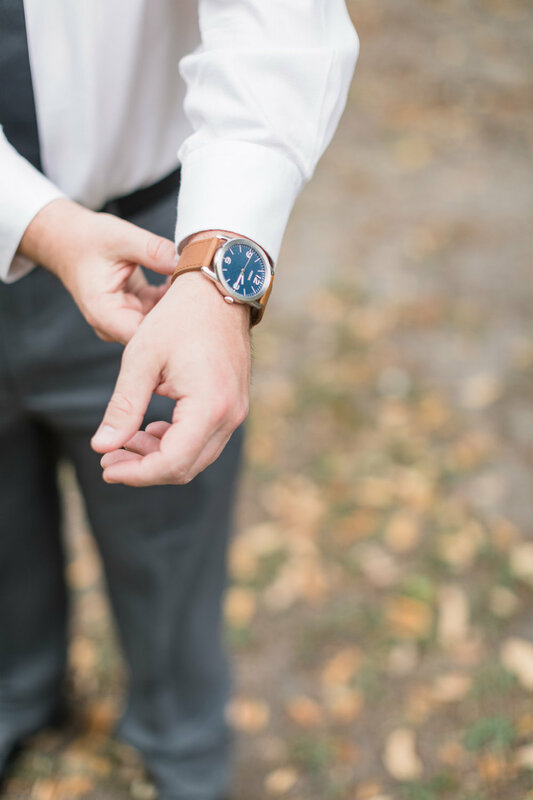 No wedding day is complete without carefully selected outfits. 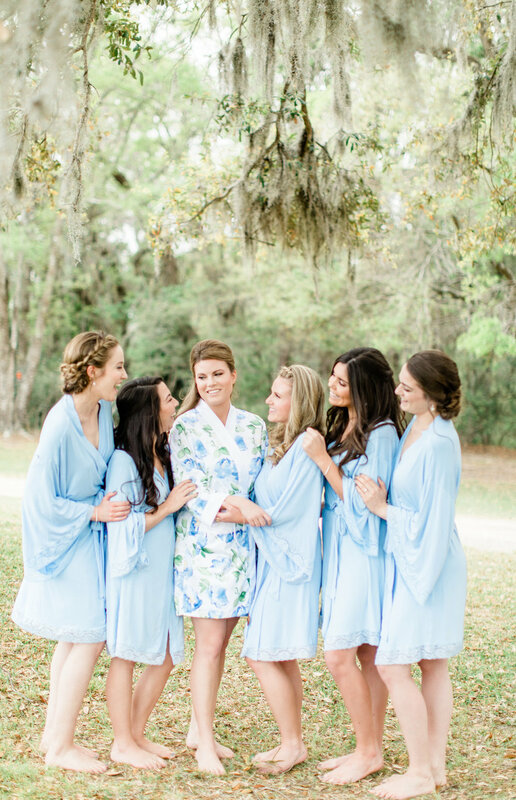 Morgan went to find her dream gown with her mother, sister, and future mother-in-law, and only had one caveat: no strapless dresses. As fate would have it, the first gown to catch her eye ended up being strapless. She tried it on, but wasn't sold on it, so the group left to try on dresses in another store. Before long, Morgan knew that she needed to return to the first store and revisit the idea of the strapless dress. 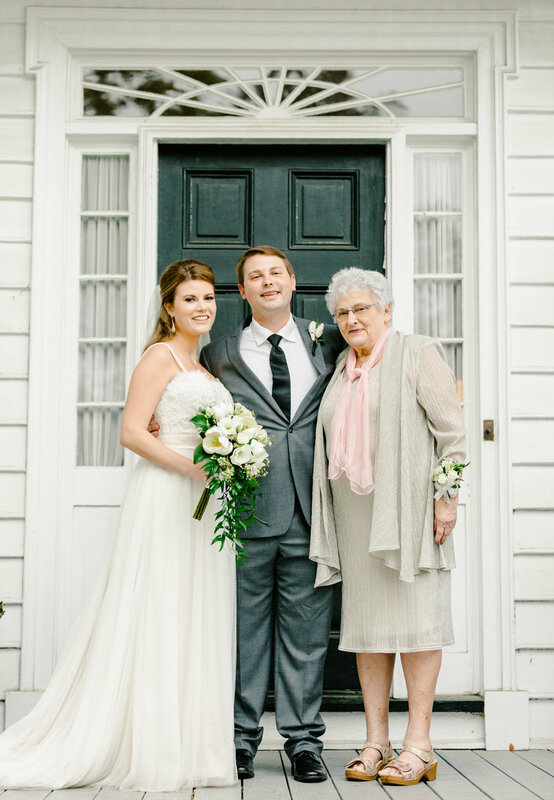 "The wonderful ladies at Beautiful Brides added pearl straps to make [me] more comfortable," Morgan says. "I accessoried the look with a vanishing fingertip veil and rose gold and pearl earrings and matching hair pin purchased from Etsy." Her shoes took a bit longer to find, and, after buying (and returning!) 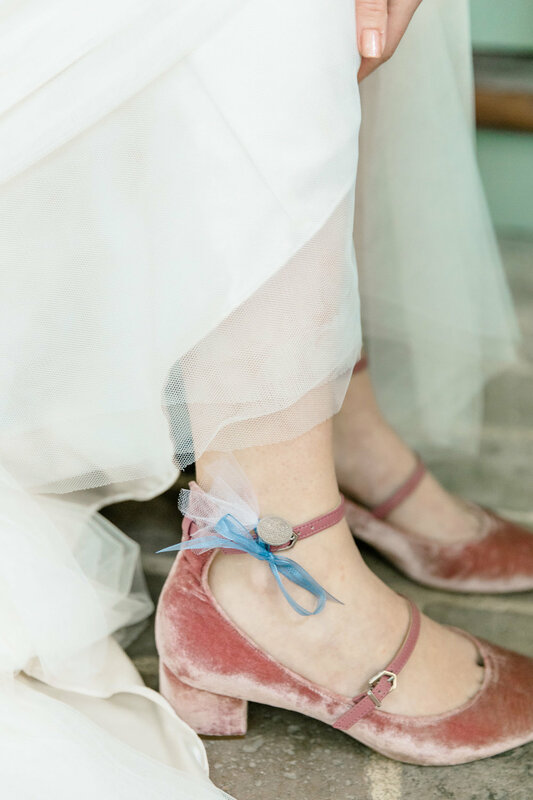 nearly a dozen pairs of shoes, the bride settled on a pair of beautiful velvet rose pumps with a block heel. Stephen also had a vision of what he wanted to look like for his wedding day, but couldn't find the perfect version. 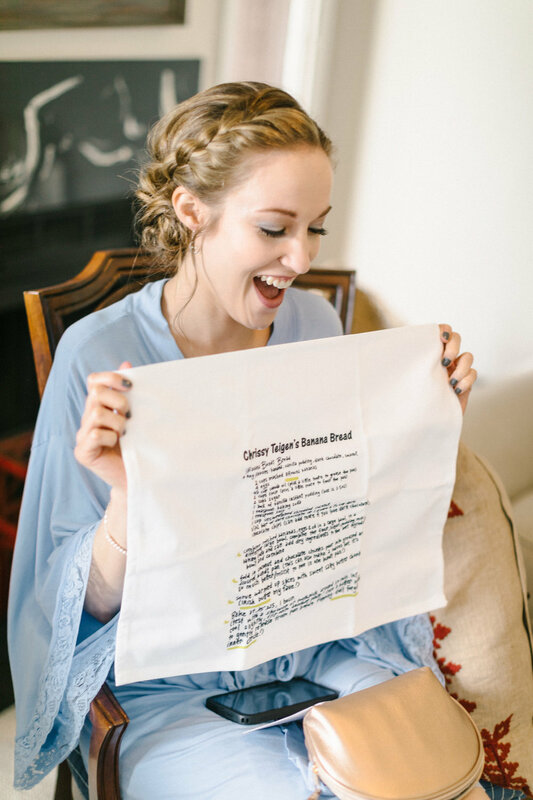 States bride Morgan, "We knew we wanted him to stand out from his groomsmen, but we weren’t sure how." 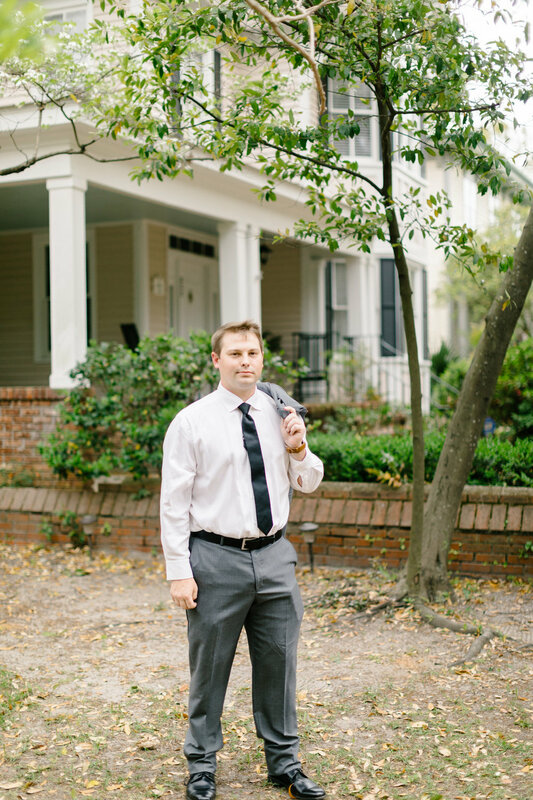 They considered suit rentals but weren't happy with the cost for all of their groomsmen; they also thought about having the groomsmen purchase their attire, but the geographical scattering of the bridal party made that option nearly impossible. 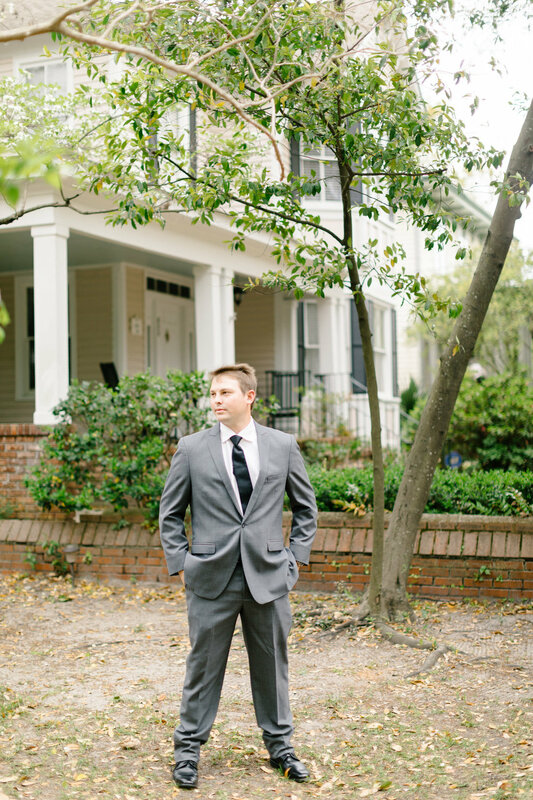 "We finally discovered Generation Tux, an online suit rental option. 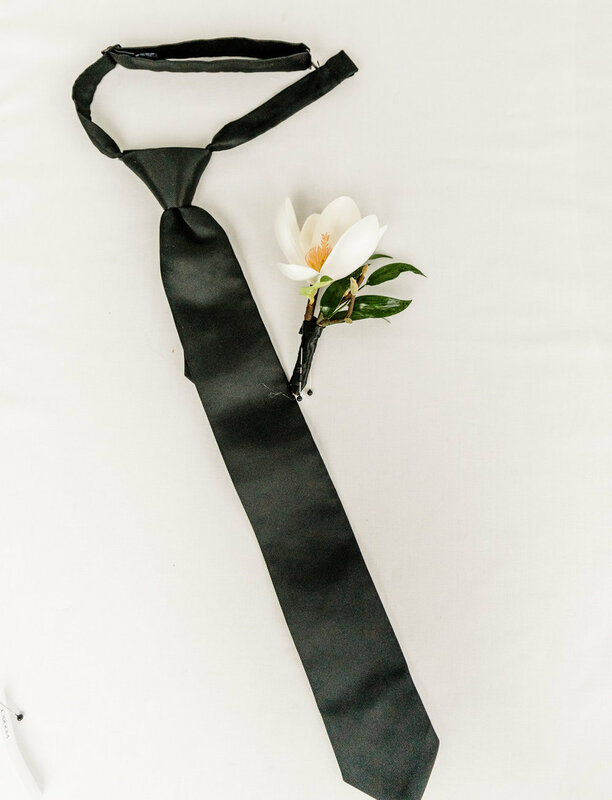 [We] worked together to select an outfit for Stephen and a complementing option for the groomsmen," remembers Morgan. The entire wedding party was happy with their selections, and everyone looked dapper on the day of the celebration! Morgan and Stephen have an app to thank for meeting one another, so yay for technology! Morgan was the one to reach out to Stephen on Tinder, and, according to the couple, "the conversation hasn’t stopped since!" They exchanged messages for just a few days before they knew they had to meet in person. 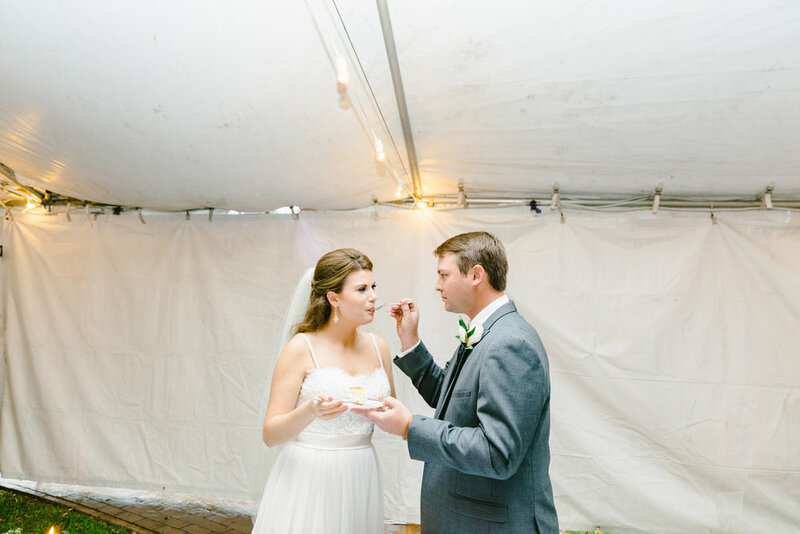 "By their second date, I knew I had found the man I was supposed to marry," gushes Morgan. 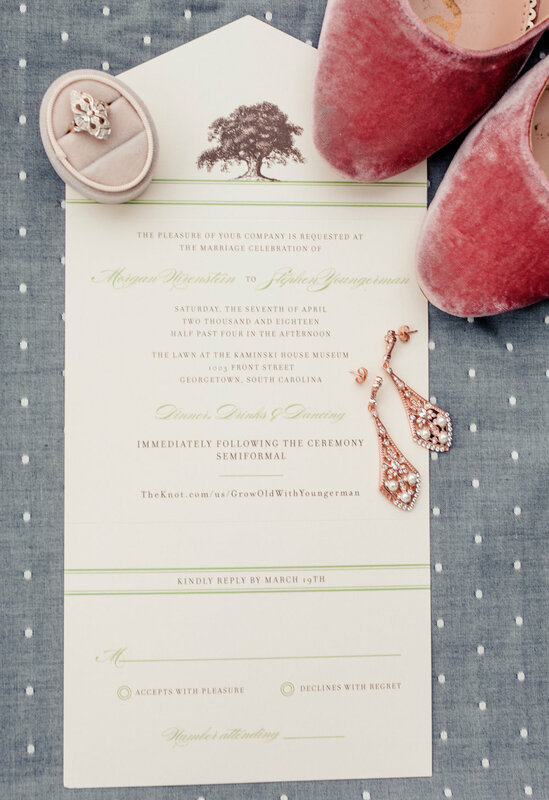 As the two realized their compatibility, their thoughts quickly turned to marriage. Morgan came across her dream ring on Instagram: it was a vintage piece in a local pawn shop. Stephen jumped at the chance to get a unique selection for his girlfriend, but discovered that the ring had been sold by the time he called the shop. Stephen wasn't daunted and worked with the pawn shop to track down the new owner of the ring. Stephen made the new owner a deal on the ring, and it was soon safe and sound in his closet. Just a few weeks after purchasing the ring, Morgan happened to be cleaning out the closet and came across the little ring box. "I freaked out but didn’t tell Stephen," she said. As it turns out, Stephen had carefully arranged items on top of the ring box to note if anyone had found it, so he knew about Morgan's discovery. In an effort to make the proposal a surprise, he waited two months until they were on vacation in Winter Park, Colorado to propose. "We stopped by the scenic Berthoud Pass to take in the view and Stephen asked me to marry him," Morgan remembers. 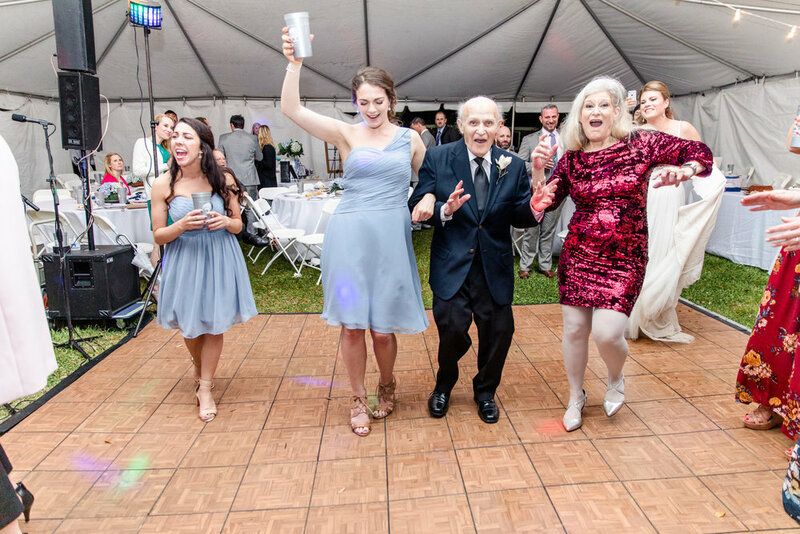 To add some personality into their wedding day, Morgan and Stephen custom designed stadium cups to give to their guests and invited their favorite live band, the Paul Grimshaw Band, to entertain their guests. Other sweet touches included having Stephen's dad officiate the ceremony, and providing Morgan's grandmother's china to set out at the tables. 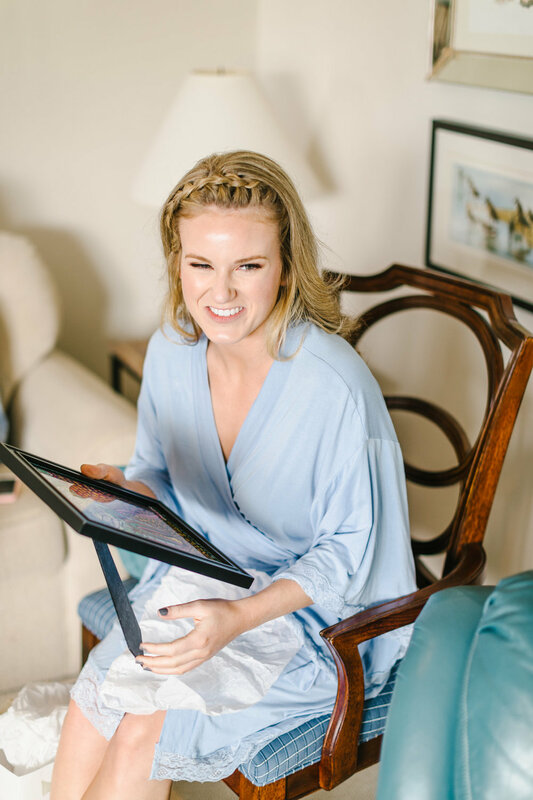 The couple shares, "Some of our favorite parts of our wedding were reading letters to each other, spending the morning getting ready with our closest friends, listening to the beautiful service by the groom’s father, and celebrating with our family and friends.